It's FRIDAY...woo to the hoo! Simon Says Stamp new release "This is the Life". How super cute is this card (or a postcard if you do just one layer). The Road Trip stamp and matching die set were used. I can remember making trips with my family and saying those exact words...a million times. Using the same stamp and die.....This set is so perfect for cardmaking and Scrapbooking. (Dropped the ink pad on the bottom portion of the card, so I spritzed it with Pear Tart & Bamboo Fireworks)...SAVE! Using the new Ice Cream Cone Parade die..UPSIDE DOWN. 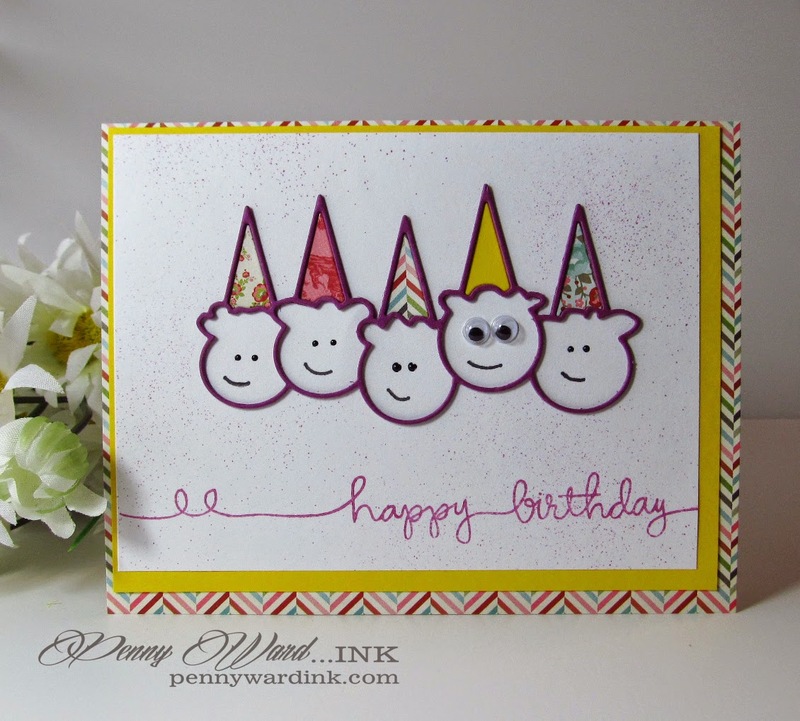 I thought it made a fun kids card, with the funny faces and Birthday hats! I am linking this to Darnell's Birthday Party Challenge because Darnell will find this funny! How about individual Ice Cream Cones die to celebrate the birthday girl? 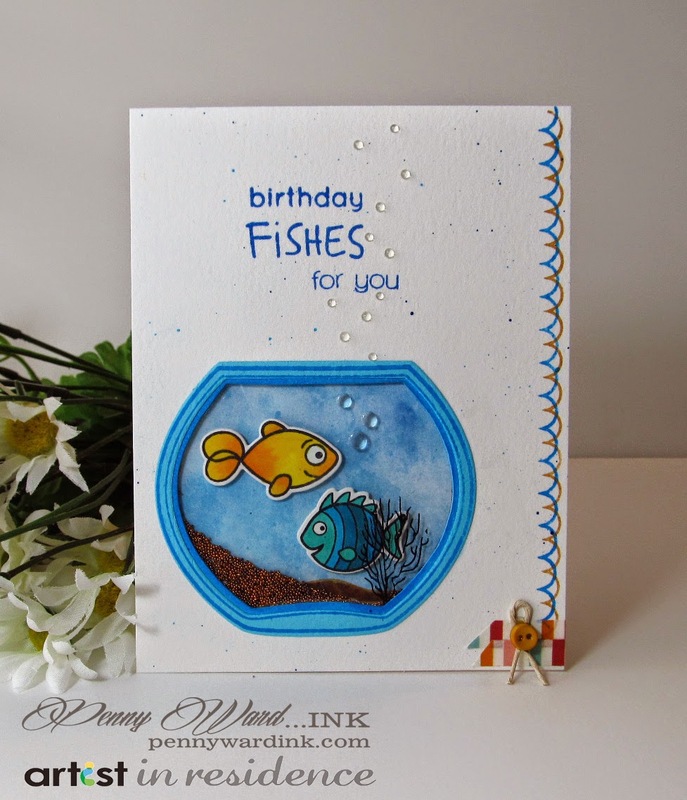 A shaker card with the new Best Fishes stamp set and matching dies. I must have had the oopsies this week, as I messed up the bottom right corner, but alas...washi tape and a button saved the day. Embellishments are a good thing! All cards have been entered in to Virginia's View Die cut Challenge. Best Fishes has been entered into the Clear Card Stock card challenge at Simon Says Stamp Wednesday. 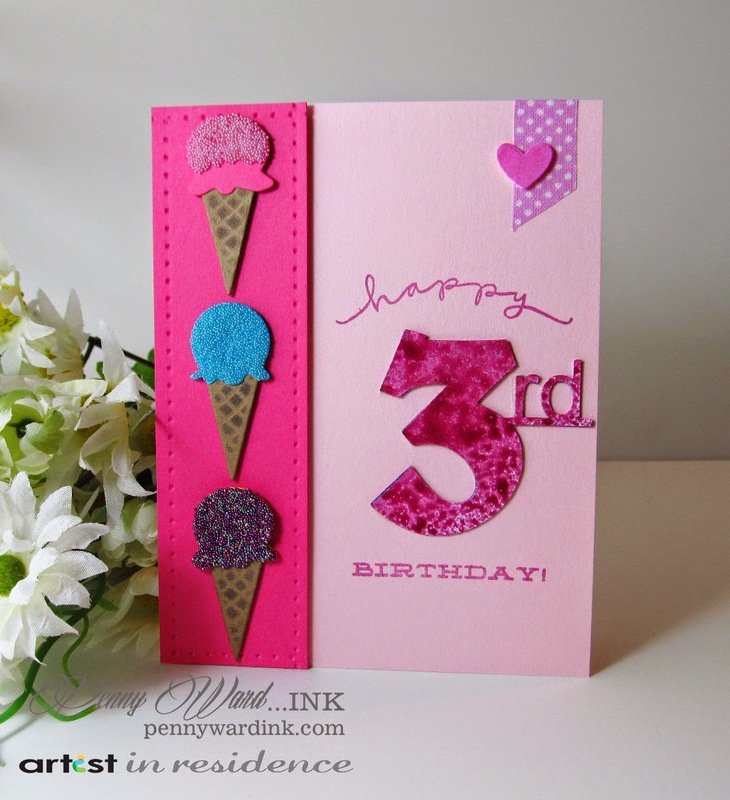 Simon Says Stamp: Road Trip stamp & die, On The Road die, Ice Cream Cone Parade die, Ice Cream Cones die, Best Fishes stamp set, Fish and Bowl die set, Happy stamp set, Love This stamp set, Handwritten Borders stamp. Imagine Crafts/Tsukineko: Memento Luxe Pear Tart, Olive Grove, Pistachio, Rose Bud, Lilac Posies, Danube Blue, Bahama Blue & Teal Zeal. VersaMagic Aspen Mist. StazOn Cactus Green. Pear Tart & Bamboo Leaves Fireworks. Lilac Posies & Danube Blue irRESISTible Texture Sprays. It's Friday and I would like to welcome a newcomer. You are so creative....these cards are adorable! I really love how you turn the ice cream cones upside down...very cute. These cards are super cute! I *love* the fishes card!! Love seeing your takes on these new SSS stamps, Penny! The road trip one is really fun and I like the bold colors with the black card stock together! I love your attentions to the details with these designs! So glad that you join the fun over Virginia's View Challenge! I must say I loved every single one of those cards - liked the little peeks you showed us as well. From the peeks I could tell really awesomely cool and cute cards were coming!! And you SOOOOO DID NOT disappoint!! Good for you, what a fun opportunity!! Have a delightful day!! 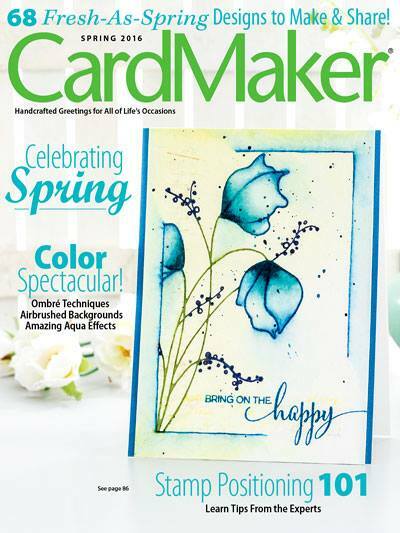 Wow, Penny, what an honor to have a card in this incredible line-up of amazing designs be designated as a birthday card for me!! I love each and every one of these and I want all the products!! Sigh!